Choloy is a village and commune in the Department of the Meurthe-et-Moselle, 28 kilometres west of Nancy and some 5 kilometres west of Toul, a town on the N4 road from Paris to Nancy. The village is south of the River Moselle on the minor road (D11B) from Toul to the neighbouring village of Foug. 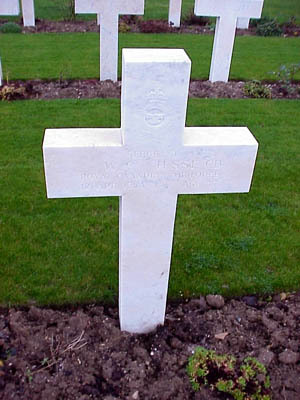 The CHOLOY WAR CEMETERY is 3 kilometres west of Toul on the north side of the D11B road. 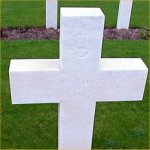 The Choloy War Cemetery is the last resting place of casualties from the First and Second World Wars and is managed by the Commonwealth War Graves Commission. It is also the final resting place for many Royal Canadian Air Force members and their families who died while serving in Europe as part of 1 Air Division between 1953 and 1967 and other Service Members serving with NATO in Germany following Canada's departure from France. Grave marker – Photo by Malcolm Cromarty.